Our values shape our identity and guide all our decisions. The constant desire to excel and to offer superior quality products and services is in our genes. Each member of our team works with passion and rigour and makes a point of being thorough. Integrity is one of our fundamental values. The transparency and honesty of our team are the keys to the enviable reputation we have established, and they have allowed us to become internationally recognized. Respect comes in many forms at Prograin: respect for people (employees, suppliers, customers, and partners), nature, our raw materials, our products, standards, or simply for the commitments we make every day. Vitality is the cornerstone of our success. In fact, the energy that our team constantly deploys to push back boundaries, innovate, and ensure the highest quality of its work enables us to achieve our ultimate objective, which is to offer what is best and always make it better. Exceed our customer’s expectations, be attentive and proactive regarding their needs, and ensure that we support and advise them properly. These are the key ingredients that we cultivate in order to consolidate our business relations and ensure our customers are fully satisfied! Prograin is the largest private value-added soybean company in Canada. Our outstanding expertise and advanced technologies have made us a world leader in the development, conditioning and marketing of superior quality soybeans. Our activities are centred in Saint-Césaire, in the heart of the province of Quebec, not far from the Port of Montréal. Our research centre and conditioning centre are among the world’s most modern. What sets us apart is our varieties of early maturing soybeans, which are adapted to the climatic conditions of short season growing areas (groups 000 to 1). With more than 100 varieties developed and continually improved at our state-of-the-art research centre, we are positioning ourselves as a key player in Canada and abroad, with the ultimate goal of offering the best varieties and the best seed quality to our customers. The soybean varieties we develop at our research centre allow us to offer high-quality food-grade soybeans with properties specifically sought after in the local and international markets. Our activities are fully integrated to provide listening, service and ongoing support to all our customers. We are proud to export Canadian producers’ harvests all over the world! 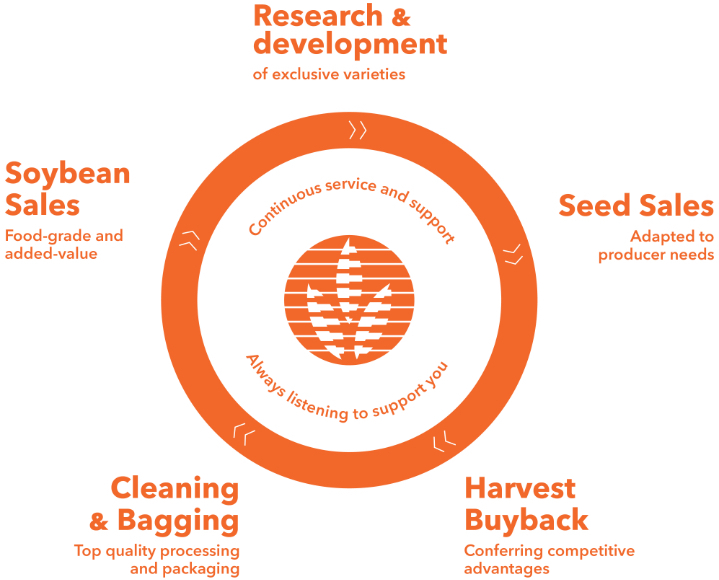 In Europe and Asia, our soybeans are valued as much for their nutritional characteristics as they are for our team’s human and passionate approach. Chance has nothing to do with the strength, durability, and authenticity of the relationships we have been and are still building with our clients around the world. We truly believe in their success and make every effort to contribute to it. We are internationally renowned, and the company feeds the regional economy as well as millions of people worldwide.